There's a reason for the existence of standard setting organizations: to create a uniformed method for maximizing safety in a given industry. The American National Standards Institute (ANSI) helps to assure the health and safety of consumers, workers, and the environment by setting standards on things such as chemical labels and signs. 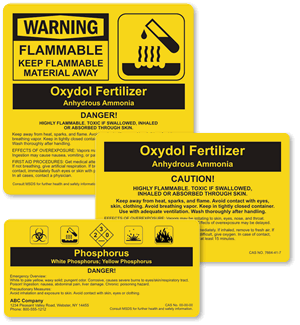 Our Custom ANSI chemical labels below are universally recognized by people handling hazardous chemicals and materials, so that unnecessary accidents are avoided. • Make sure your substance and its potency are easily identifiable, with colorful and visible adhesive ANSI Labels. Create a label for a specific substance requiring special instructions; our custom-wizard is easy and fun! • Customize your own to label any substance you need. First, start with hazard symbol. Second, add the chemical name and its synonym. Then add signal words and statements of hazard. And finally enter the text for precautionary and first aid procedures. Its fast and extremely easy to use! • Our labels come in paper, polyester and vinyl options. Hover over any of them with you mouse to view specs and pricing for a specific product. Give us a call if you have any questions or need some assistance. We have an excellent customer support team waiting by the phone to assist you. Displayed in size order, these Custom ANSI Labels are customizable to give you options and flexibility. To view over 130 Chemical ANSI Labels in stock click here!